Years ago I was invited to Hong Kong to attend a food festival, and we visited many historical spots and restaurants. One memorable meal began with lettuce cups filled with minced pigeon. I loved it. Since pigeon (squab) isn’t easy to find and is very expensive, I decided to reinvent that taste memory with minced chicken. It has also become a classic dish on many Chinese restaurants menus. 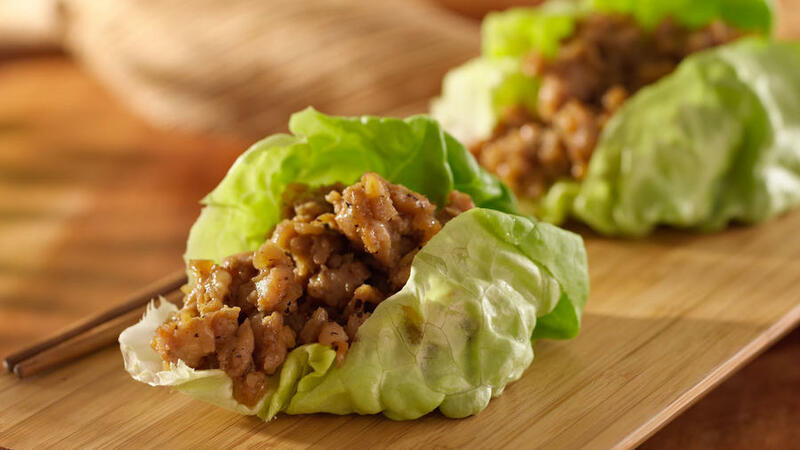 These Asian-flavored, minced-chicken-filled lettuce cups are incredibly delicious for a luncheon or as a starter for dinner. I usually select ground white meat chicken but you could also use ground turkey. Flavoring the chicken first with the soy sauce, sesame oil and rice wine vinegar adds a rich taste sensation. Hoisin and lots of pungent fresh ginger enrich the simple chicken flavor. The red pepper and water chestnuts add texture. You can omit them and add pine nuts and Chinese mushrooms for a variation. The chicken filling still has excellent texture and flavor. As a main course, plan on two or three of these per person. 1. In a medium bowl combine the chicken with the soy sauce, vinegar and sesame oil. Set aside. 2. In a wok over high heat add the peanut oil. When the oil is hot but not quite smoking add the chicken and toss every 15-20 seconds for 1 2 minutes or until no pinkness remains. Push the chicken up the sides of the wok, spreading it around so all the chicken comes into maximum contact with the hot pan and breaking it up as you toss. 4. When cooked, push all the chicken up the side of the wok and out of the way and then add the red pepper, scallions, ginger and water chestnuts and toss for 1 minute. Add the reserved sauce ingredients and toss every 10-15 seconds with the chicken and vegetable mixture until well blended and slightly thickened, about 1 minute. 5. Arrange the lettuce cups on a platter or on individual plates and mound with an equal quantity of the chicken mixture. Serve immediately.